Horses at Bergen Ranch are Hypoallergenic and people with allergies are welcome to test their allergies on our horses. Our horses here on the Bergen Ranch are raised and trained to excel at all ranch jobs and western events. They are North American Curly bred and crossed with Quarter Horse lines that are checked for nature, good bone and feet. They must have (cowability) and are extremely trainable. All of our horses must have that quiet curly nature combined with the ability to read and work cattle. They must be quick and have that quiet refined ‘good looks’. We get lots of remarks like "I didn’t know that the Curlies were ‘that refined’, or ‘that big’ or ‘that fast’. These are just some of the remarks we get from top horsemen from our area. We want our horses to be good enough looking to get second looks, and not of curiosity, but of admiration. We try to stay away from extreme traits and yet keep them strongly hypoallergenic at the same time. Our horses must first and foremost be top working horses. Our breeding stallions must be good looking with good intelligent heads, they need to be fast, agile and have cow sense. They need a pedigree because I want to know their genetic faults as well as their genetic good points. While we have ABC registered horses, we register our Curlies only with the ICHO registry to which I have been a member since 2000. The ICHO registers all curly horses and is dedicated to "Quality, Equality and Forward Vision. THE NORTH AMERICAN CURLY HORSE raised here on the Bergen Ranch is the horse for every one and anyone, he is hypoallergenic, he is gentle and people oriented. Being extremely fast and athletic with an abundance of stock sense he makes the ideal mount for anyone wanting a working pleasure horse. (1) What is a North American Curly Horse? (2) Why are they unique to all other horses? (3) Where do they come from? (1) The North American Curly Horse is a very versatile horse that has anywhere from tight curls to a slight wave covering all or parts of the body. Most have a curly mane and sometimes a curly or wavy tail. Most lose some, or all of their mane and sometimes some or all of their tail hair upon spring shedding. The ones that lose all of their mane and tail hair are known as extremes. Bergen Ranch tries not to raise any extremes. (2) The curly horse from North America is very unique to other horses in that these animals are hypoallergenic. This means that people that are allergic to other horses are not usually allergic to North American Curly Horses. (3) The exact origin of the North American curly horse is somewhat the greatest mystery in the horse world today. However there are many theories (most of them now proven wrong) The most known and most widely publicized theory is that they came from the Bashkir area of Russia. However this theory has been proven, beyond a doubt, to be erroneous. Also the Bashkir horses in Russia are not curly. So where did they come from? The North American Curly Horse is more than just a horse, they very easily become a life style. I've spent most of my living days training horses and dogs and working with livestock, the rest have just been wasted. 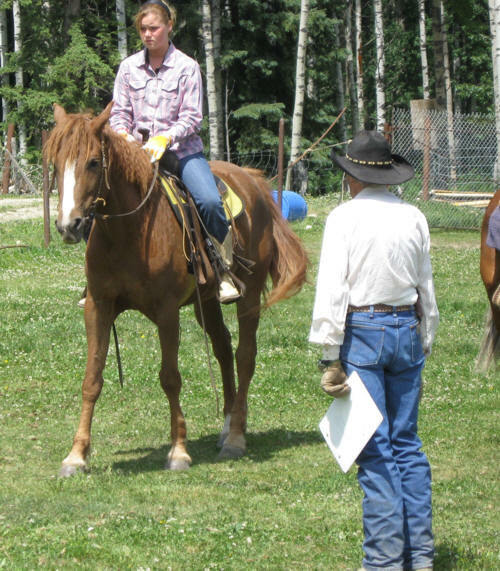 Come to Bergen Ranch to learn to ride, handle and train horses. There are quiet well trained horses to green broke horses all with some form of hypoallergenic features.